2. Jarrett Smith,Geraldine Seydoux, et al. "Liquid-like P granules require ATP hydrolysis to avoid solidification." bioRxiv,Jan. 10, 2018. Hostein I, Robertson D, DiStefano F, et al. 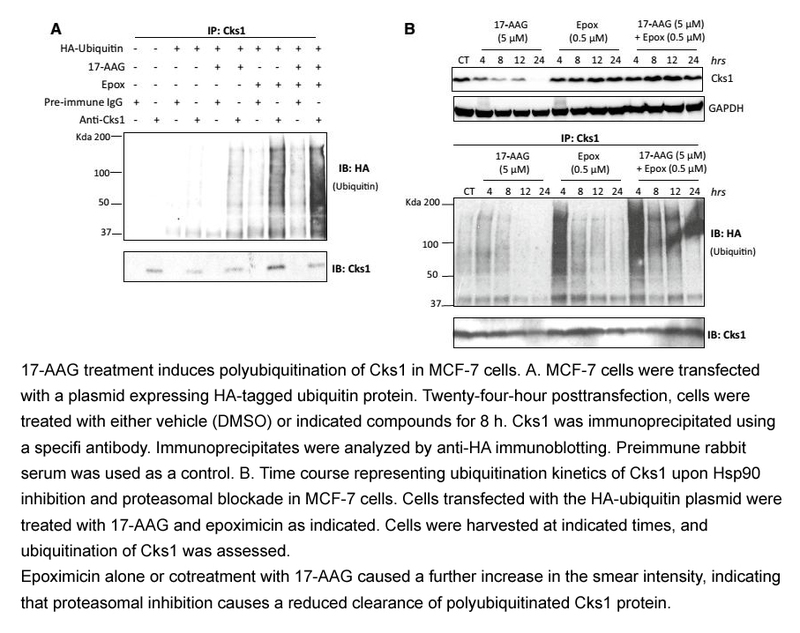 Inhibition of signal transduction by the Hsp90 inhibitor 17-allylamino-17-demethoxygeldanamycin results in cytostasis and apoptosis. Cancer Research, 2001, 61(10): 4003-4009. Solit D B, Zheng F F, Drobnjak M, et al. 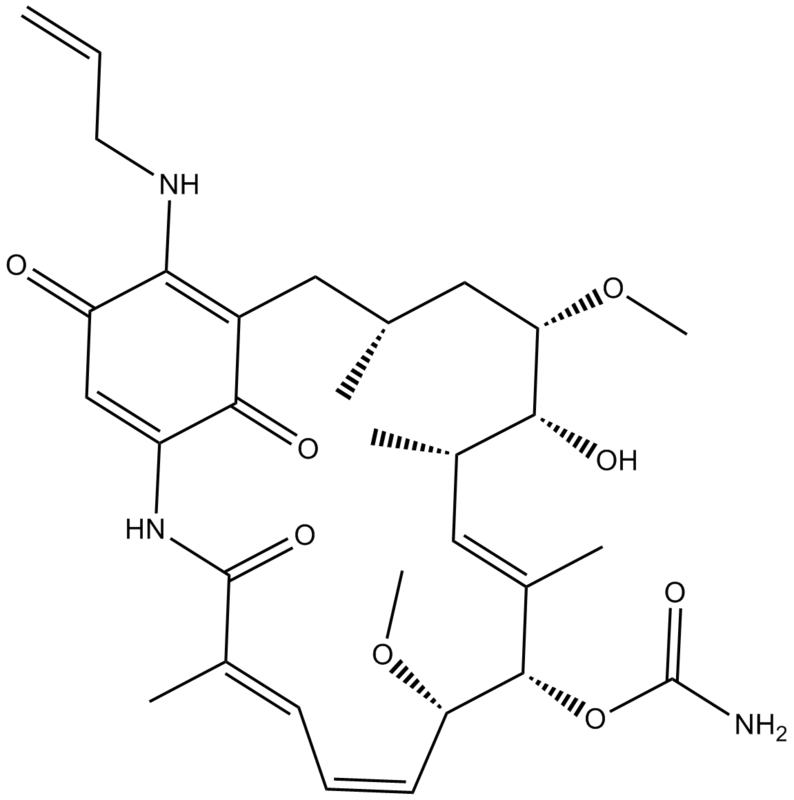 17-Allylamino-17-demethoxygeldanamycin induces the degradation of androgen receptor and HER-2/neu and inhibits the growth of prostate cancer xenografts. Clinical cancer research, 2002, 8(5): 986-993. 1. 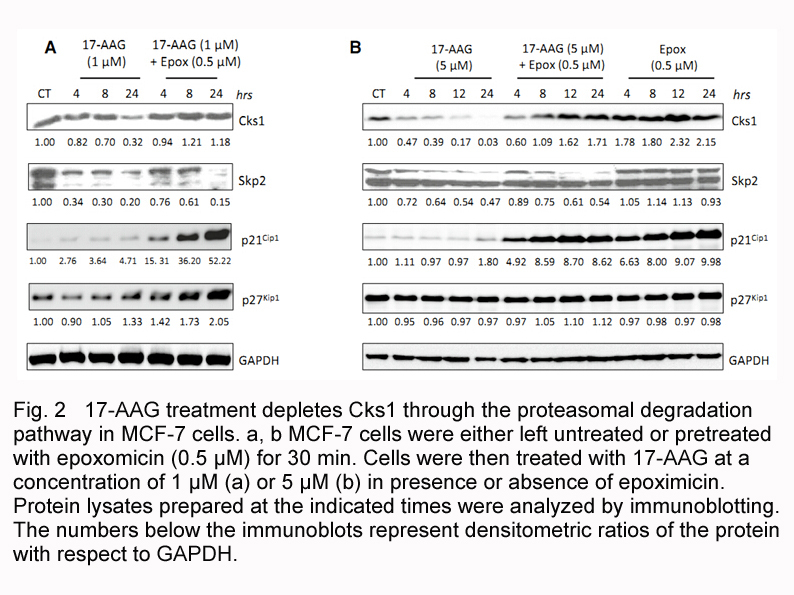 Mode of cell death induced by the HSP90 inhibitor 17-AAG (tanespimycin) is dependent on the expression of pro-apoptotic BAX. Oncotarget. 2013 Nov;4(11):1963-75. 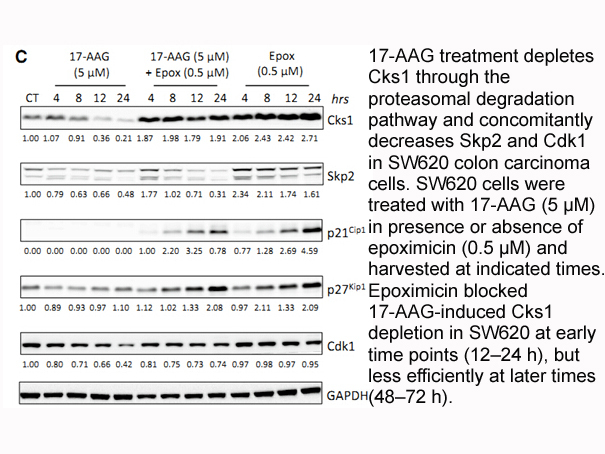 17-AAG induced BAX-dependent apoptosis at pharmacologically relevant concentrations in BAX knockout HCT116 human colon carcinoma cells both in vitro and in tumor xenografts in vivo, where 17-AAG predominantly inhibited cell proliferation rather than promoting cell death. 2. 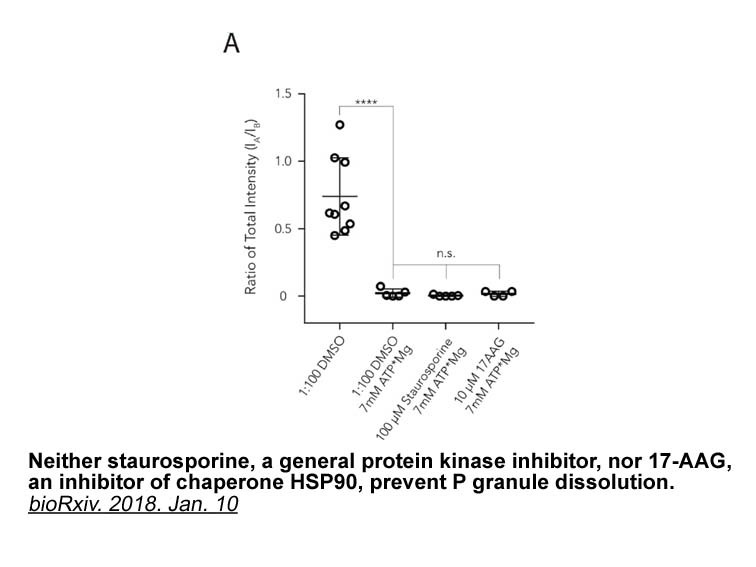 HSP90 inhibition is effective in breast cancer: a phase II trial of tanespimycin (17-AAG) plus trastuzumab in patients with HER2-positive metastatic breast cancer progressing on trastuzumab. Clin Cancer Res. 2011 Aug 1;17(15):5132-9. doi: 10.1158/1078-0432.CCR-11-0072. Epub 2011 May 10. 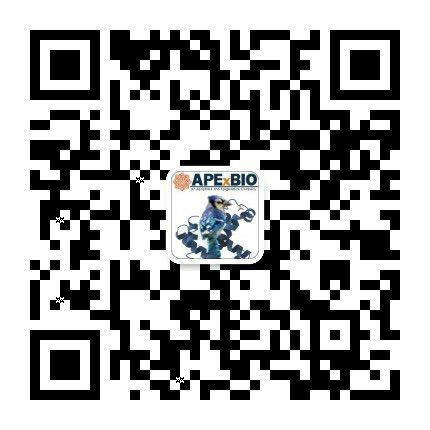 17-AAG is a naturally occurring inhibitor of HSP90 that binds to HSP90 and hence induces the degradation of its client proteins. 3. A Phase II trial of 17-allylamino, 17-demethoxygeldanamycin (17-AAG, tanespimycin) in patients with metastatic melanoma. Invest New Drugs. 2012 Feb;30(1):341-9. doi: 10.1007/s10637-010-9493-4. Epub 2010 Aug 5. 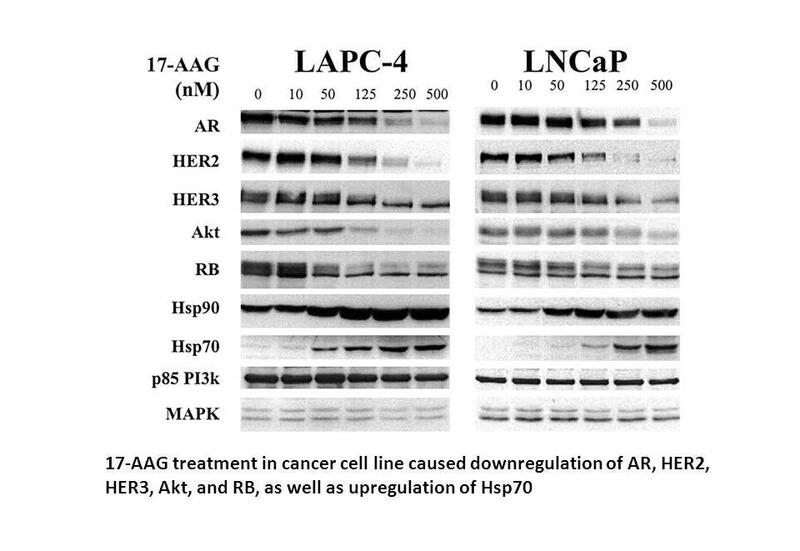 17-AAG, an inhibitor of HSP90, was screened for its anti-melanoma activity. 4. Combined delivery of paclitaxel and tanespimycin via micellar nanocarriers: pharmacokinetics, efficacy and metabolomic analysis. PLoS One. 2013;8(3):e58619. doi: 10.1371/journal.pone.0058619. Epub 2013 Mar 7. 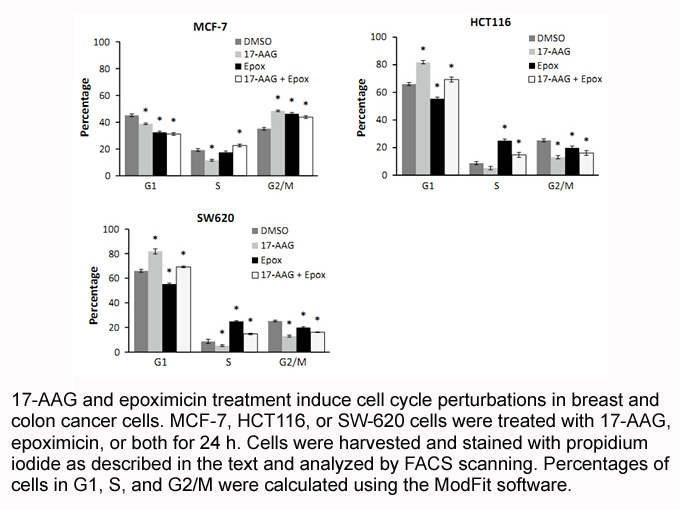 A serious disadvantage in the promising Paclitaxel/17-AAG combination cancer therapy is the requirement of large quantities of toxic organic surfactants and solvents to solubilize the drug. 5. Molecular mechanism of 17-allylamino-17-demethoxygeldanamycin (17-AAG)-induced AXL receptor tyrosine kinase degradation. J Biol Chem. 2013 Jun 14;288(24):17481-94. doi: 10.1074/jbc.M112.439422. Epub 2013 Apr 29. 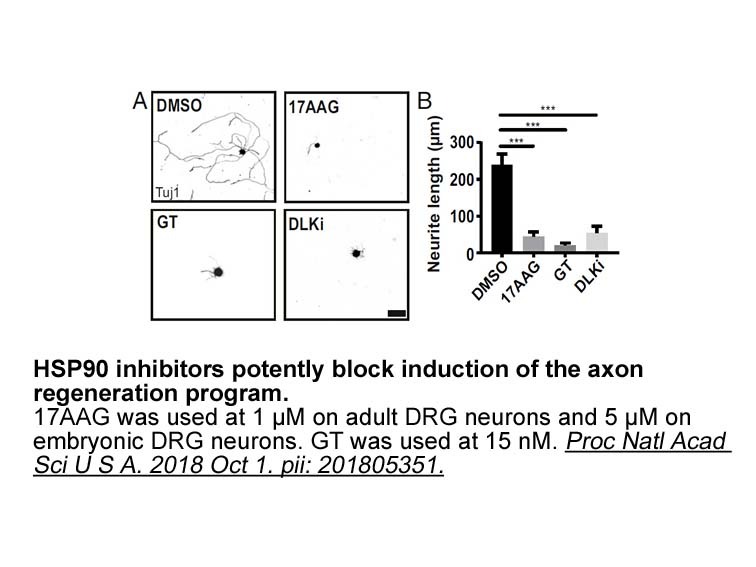 17-AAG induced the down-regulation of AXL expression in a time- and dose-dependent manner through promoting AXL polyubiquitinlation and subsequent proteasomal degradation, in which 17-AAG requires AXL intracellular domain regardless of AXL receptor phosphorylation. Kamal A, Thao L, Sensintaffar J, et al. A high-affinity conformation of Hsp90 confers tumour selectivity on Hsp90 inhibitors[J]. Nature, 2003, 425(6956): 407-410.